One very important frugal idea and home organising is making your grocery list and then limiting the amount of times you visit the grocery store. Since we started this project a LONG time ago of getting our inventory in order, I thought that maybe we should carry it on. Grocery lists and menus go hand in hand. Check out this post on menu planning. To start your grocery list have a paper and pen always handy, I have a piece of paper on my fridge to write down everything that we are out of. There are more permanent types, digital types, wipe off types, but I think it's great to have it in a spot where everyone has access to it so that they can contribute to it. 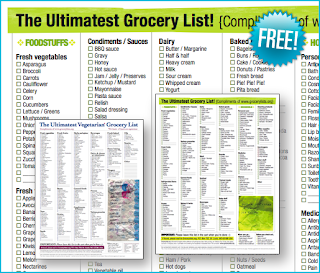 This is a really great grocery list that you can download and keep in a plastic sleeve on your fridge. Take everything that is on your inventory list that you have used recently and mark it on here so that you are ready to go. Then from there, on flyer day, mark those things down that are good deals that you are going to get. Also, when you make up your menu, mark on your grocery list the items that you need to get to make your meals for the next couple of weeks. I like to put a star next to an item that I have a coupon for just as a reminder of what coupons I need to hand in before I leave the register. It upsets me so much when I get home and find a coupon in my purse that I neglected to use at the store. All of these things make up a great grocery list. Now here are the keys: take the list with you and ONLY PURCHASE THE THINGS ON THE LIST. I know it seems obvious, but it's the truth and needs to be put out there. We all buy items that aren't on our list. I am just as guilty as the next person, but when you are trying to save money really stick to your list. When you get to the store, check out the coupon boards to see if you can find any additional savings. Grab any that you will use for future purchases as well, but be sure to leave some for other frugal shoppers. 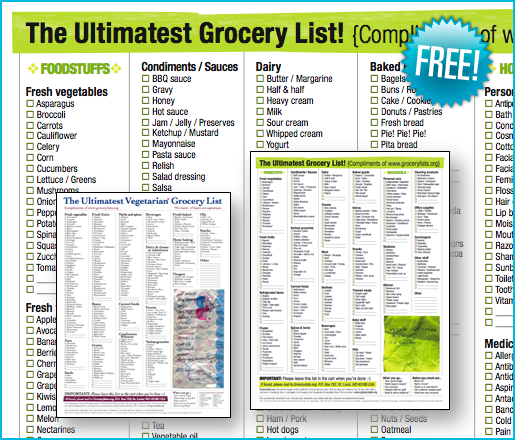 What type of grocery list system works for you? Send us a comment as we would love to hear from you and share your ideas. lol, I rarely make a full on grocery list. We are a "fly by the seat of our pants" kind of family. After I shop, I make up a meal plan, or try to. If I made a list and only bought that, I probably wouldn't have as wide a variety as we get as there are often in store specials. I keep a price list of the things we generally buy in mind, then I go through the fliers and write down what to get. Then when I shop, I add items that are on sale but not in the flyer. Sometimes I get to the store and decide what I had on my list wasn't that great a deal after all. However I do try to make sure I only buy things we will use. I am currently going through my storage and eliminating things we over bought and never used, like way too many beans and canned goods which are getting close to the best before date. The food bank has been getting a lot of donations lately, lol! It has been a learning experience to be sure and I continue to learn.